Fresh is your local Health and Fitness Gym in Shepperton offering quality training with first class customer service. We’re not like other gyms as we’re owned and run by qualified personal trainers who work hard as a team to deliver a fun, friendly and supportive environment in a relaxed atmosphere, where everyone is welcome. 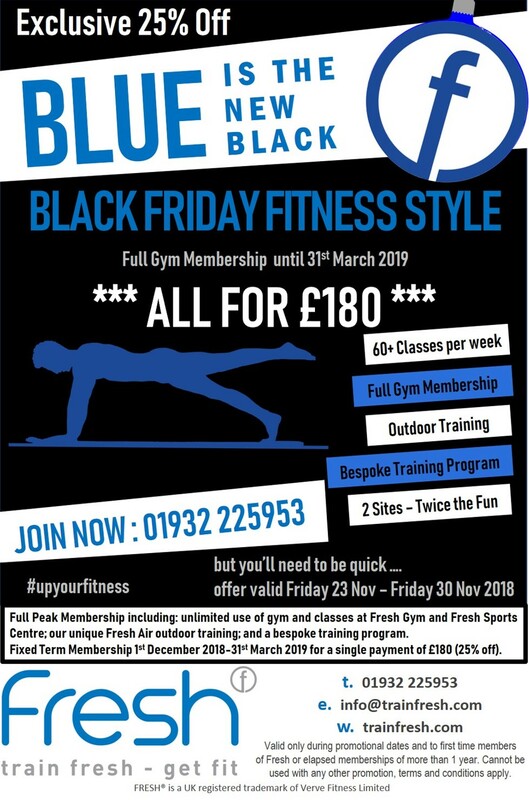 Make the most of this fantastic Black Friday deal and saving a whopping 25% on Membership. across two sites, the Fresh Gym and Fresh Sports Centre – two sites, twice the fun! 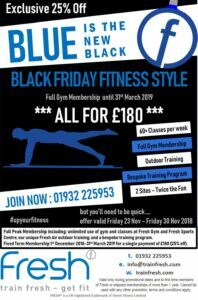 But you’ll need to be quick … this offer is valid Friday 23rd November to Friday 30th November 2018 only. Kick-start your new year early. To find out more, or to join, call 01932 225953 or email us.